The Samsung Techwin MPV 6×6 Wheeled Armoured Personnel Carrier T was developed for The South Korean military requirement for a family of 8×8 and 6×6 wheeled Armoured Fighting Vehicles for its security forces and ROKA Reaction Force (much like the US Armies Stryker Brigades). 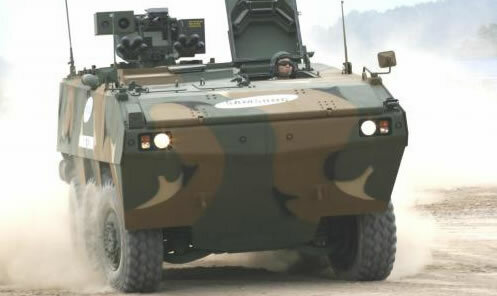 The Hyundai Rotem KW1 Scorpion 6×6 Wheeled Armoured Personnel Carrier aka 6×6 WAV (Wheeled Armored Vehicle), was selected in 2012. Samsung Techwin’s contender is the MPV (short for Multi-Purpose Vehicle). 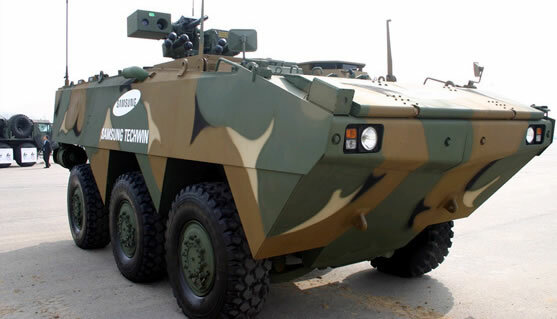 The first prototype was completed around 2006 and successfully past desert and urban combat conditions trials with the Algerian Army in 2007, which lasted 2 months. The company has reported strong interest from a number of countries in purchasing the vehicle. The family (which does not appear to be fully developed) uses a common chassis, power-pack, drive-line and independent suspension system. It offers the two man crew an all-round protection from155mm Artillery shell splinters, 7.62mm Machine Gun fire and larger 12.7mm Armour-Piercing rounds across the frontal arc. Like all modern ROKA vehicles its expected to offer a full NBC protection filtration system. The baseline APC version which will no doubt full-fill the bulk of the planned order, can transport 10 troops and fitted with a Remote Weapon Station capable of mounting either a .50 Heavy Machine Gun or 40mm automatic grenade launcher. At 16 tonne’s the vehicle is transportable by C-130 aircraft.